Ahah very good idea, thanks!! This perfect solution helped so badly. Thanks a million bro! Clever 🙂 I’m kinda kicking myself for not seeing that myself. Thanks! You know that there is a built in option to do that, right? Settings -> Forwarding and POP/IMAP. The first option is to choose the address you want to forward all you emails to. Nifty solution. Filters/rules are helpful for more than forwarding. E.g., Gmail messages that I accessed via Apple mail would often come through marked “Important” for reasons known only to gremlins. Thanks to your tip, they no longer do. “You know that there is a built in option to do that, right? 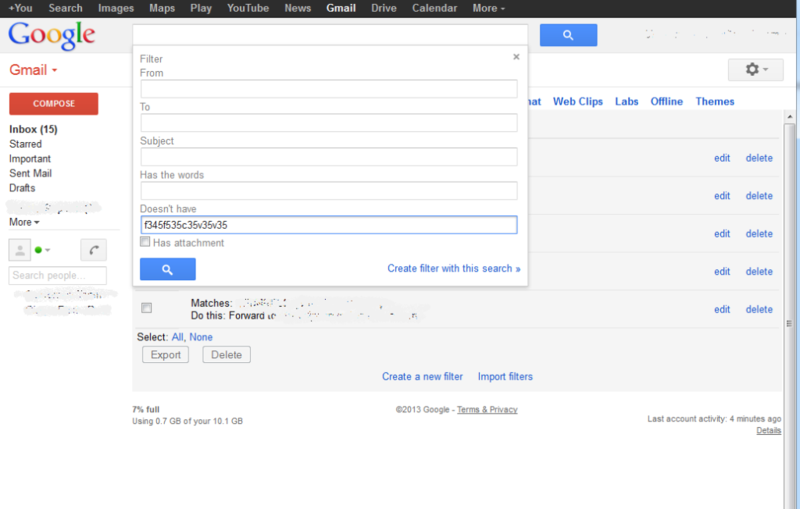 The different between a filter/forward and forward is that filter/forward can forward to multiple email address. a forward can only send to one email address. Wow, thanks, neat workaround! Exactly what I needed haha! @Arik, that feature simply resends the email. If you want to “decorate” the email in some way, for example, add the tag “[EMAIL2]” to the subjectm then you have to use a filter. @Arik unfortunately some mail does goes into the spam. Yes, forward works with one address at a time only though. If your filter has “from:(-me)” then sent items will be excluded.. BRILLIANT suggestion! It works with all receiving settings (“To”, “Cc” and “Bcc”)… You’re a genius, thanks so much! I searched for this answer and found it, thanks! I’m with some of the others who are kicking themselves for not being the brilliant one to think up this solution. Thanks so much for sharing, you saved my brain a lot of work today! You can also put * to any of the fields. great simple idea. You are the man, thank you for sharing that! 4 years later, and still helping, thanks. Thanks a million bro!!!! Love you for this!! Still a greats solution!!! Thanks! Internal Server Error 500 on a new server Is Google Indexing your HTTPS pages instead of HTTP?